When I was about six, I woke up on Christmas morning to find a Minnie The Minx costume. Not like your 100% polyester supermarket ones now, this was hand knitted. By Mrs. Claus herself no less. (Someone wasn’t getting the credit she deserves). Off I went to mass and everywhere else, in my black knitted mini, my black and red jumper, and a black headband with the word ‘minx’ knitted into it; just in case it wasn’t completely clear who I was in the Beano and Dandy mad eighties. Next up on the viewing list for me and the husband is the latest Netflix Original Series Sense8 – it’s from the creative minds of The Wachowskis (the lads behind The Matrix​ trilogy) so it’s bound to be a bit nuts, fun and visually ground breaking. I do love the odd bit of fantasy and sci-fi so this looks like just the ticket when all the shows on regular telly are finishing up for the summer. Sense8 is centered around eight characters that live in different cities around the world who experience a violent vision, and soon find themselves mentally connected by this experience. They are suddenly able to see and talk to each other as though they were in the same place, and have access to each other’s deepest secrets. Not only must these eight adapt to this new ability and to each other, they must figure out what happened and why and what it means for the future of humanity, while being hunted by an organization out to capture, kill or vivisect them. As soon as I get a bit of time to myself, I’m planning on diving into another one that ticks the fantasy box, but this time it’s a fairy tale world in Once Upon A Time. I’ve had too many recommendations of it now to ignore it any longer. It’s seems like lots of parents are enjoying this show with their older kids, but I can’t be hanging around waiting for mine to grow up so I’m going ahead and watching it solo. None of it might get a look in at all though – The big one for me this June is Orange Is The New Black back for a third season from June 12th. Yippee! We all know that there are young wans out there making a mint on YouTube from their beauty vlogging, and that teenagers spend every scrap of money they have on products, but when it comes to mum-beauty, there isn’t generally the time or the finances to indulge yourself that much. Of course, if it’s a genuine passion the force is still probably strong in you post-baby, but if you’re anything like me the closest thing you’ve had to an epiphany is when BB Cream reached our shores. We had a go at making buns yesterday. There was a number of issues with this. It was all going okay mess wise until Ted got up from his nap. Then half the ingredients went on the countertop/floor/cat. I had no regular flour so I used spelt. That doesn’t usually cause an issue for me either. Then I realised that the milled chia seed I thought I had was in fact a mix: one third chia, one third linseed and one third hemp. So, still very good for you but maybe not suitable when what the recipe really truly was asking for was “2 eggs”. Anyway, it put in half an hour with the kids on a rainy afternoon which is never to be sniffed at. Add another ten minutes of fighting over blueberries. The mixture was very light and fluffy and the bowl got licked and the slightly sticky buns eaten, but I don’t think I need waste your time with this particular recipe. 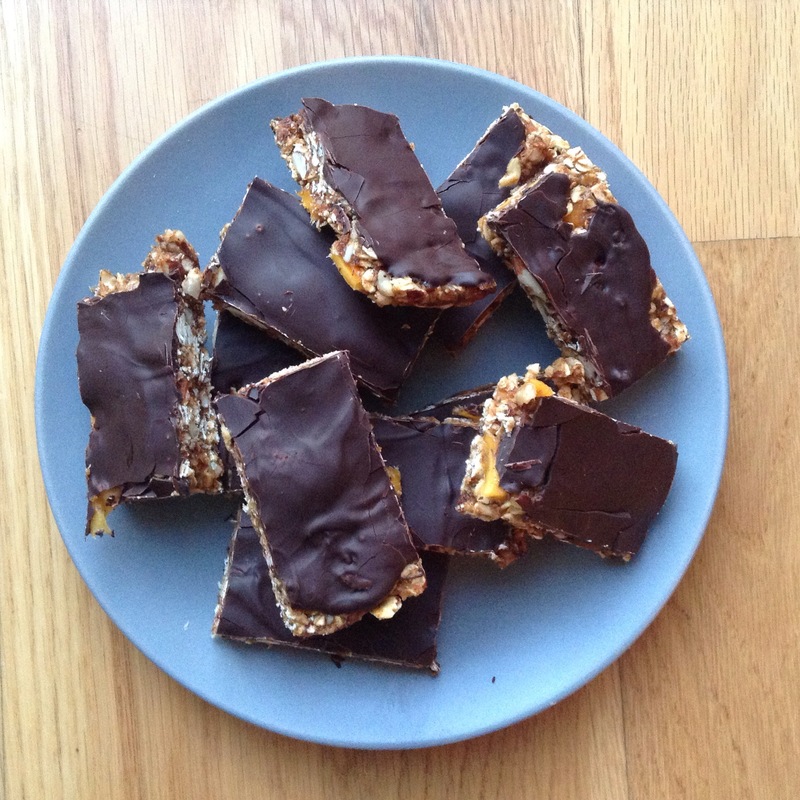 What I will share with you is an entirely foolproof no-bake granola bar recipe which is adaptable to infinity and allows you to fly by the seat of your pants in a way that baked goods don’t usually. I can’t believe I haven’t written about these before. I’ve only made them about sixty seven times. They’re fairly healthy and wholesome to boot. 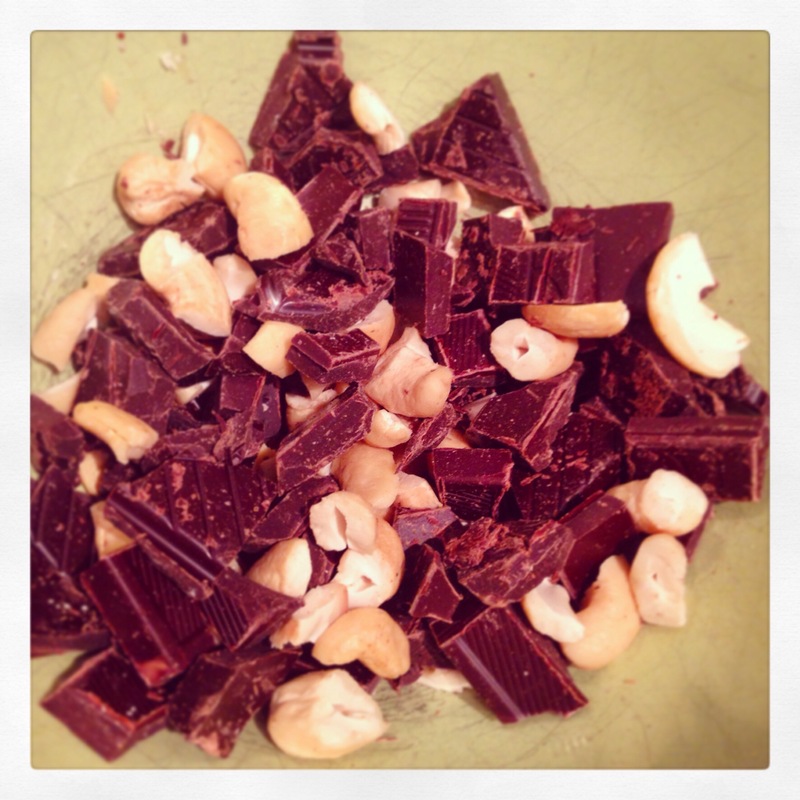 1 cup almonds, chopped roughly. Blend the dates to a sticky ‘dough’ in the food processor – there will still be bits, it won’t be totally smooth. It takes about 30 seconds in the small processor that came with my stick blender (my very favourite kitchen gadget). You can add a couple of tablespoons of water if your dates are a bit dry. I buy the deglet noor ones in Aldi. 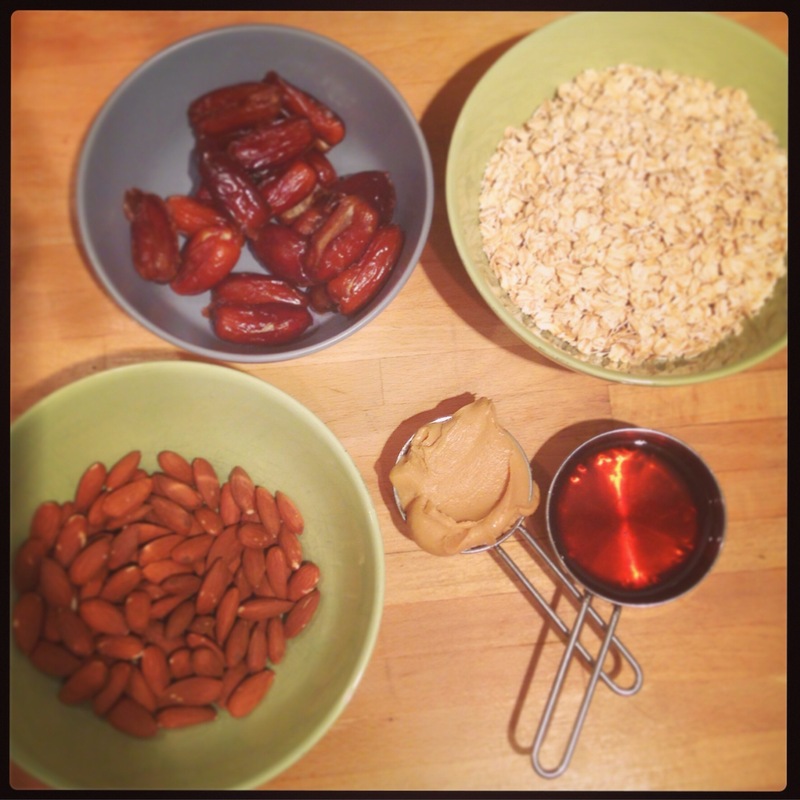 Mix the dates, porridge oats and almonds together. If you prefer the flavour you can toast the nuts in the oven for 7-8 mins, and oats for 10 mins at about 175 degrees c.
Warm the nut butter and maple syrup in a small saucepan together until they stir together easily. I use a small whisk. I only use good quality nut butters – preferably Meridian, sometimes Kelkin – as close to 100% nuts and nothing else as possible. You can use honey or agave instead of the maple syrup. I often use a blend of honey and maple syrup because y’know, maple syrup is expensive. Add the nut butter/maple syrup to the dry ingredients and mix thoroughly. Pop the whole mixture into a tray or dish. I use an 8×8 inch silicon pan I have. Now here’s the skilful bit. Place a big bit of cling film on top, then use you your hands to flatten the whole thing down. You’ll never try and use a wooden spoon or spatula again. Place in the fridge to harden. 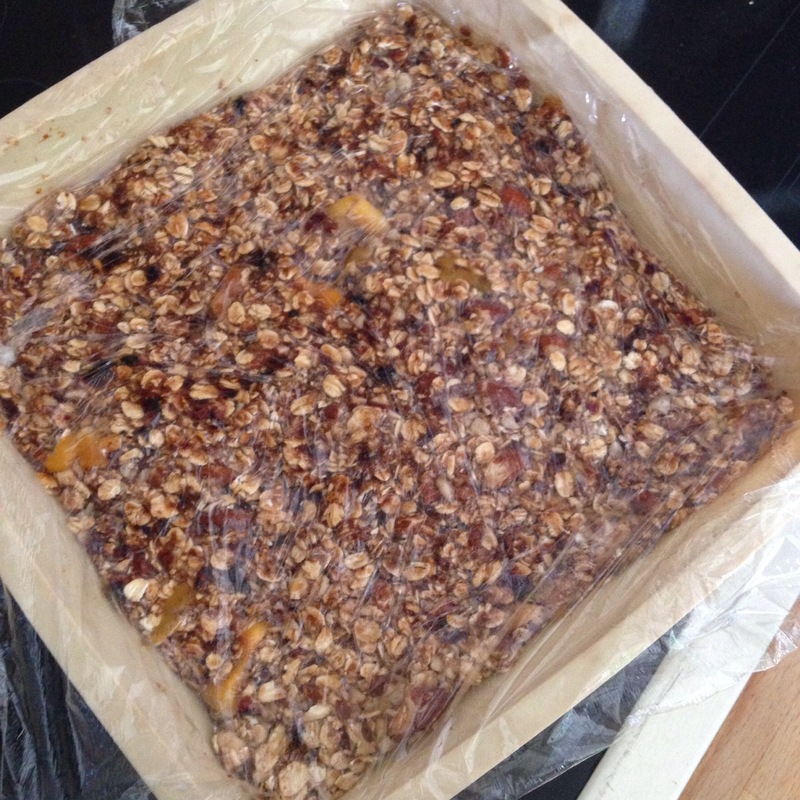 That’s the basic bars made but I never leave it there; you can add all sorts to this recipe. Some of my favourite things are toasted seeds, a variety of chopped nuts, bits of dark chocolate and dried apricot. 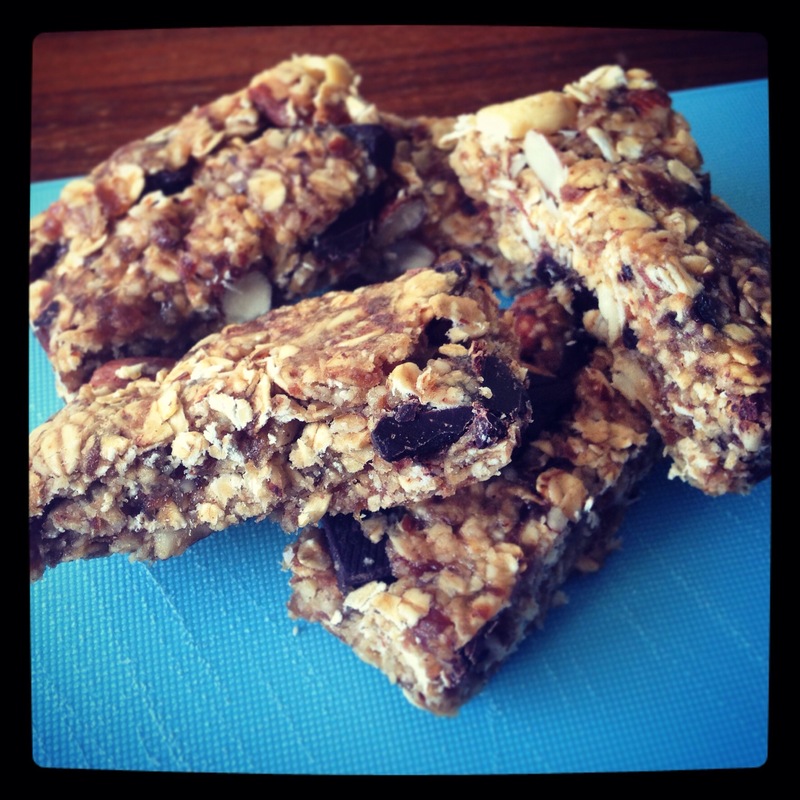 You can put in some dried cranberries or mango too for a super sweet kick. (I soak the mango in a little warm water for about half an hour and drain before using it) For a real treat you can cover the whole thing in a thin layer of 70% chocolate. These bars freeze really well, so you can stick them in a lunchbox straight from the freezer and they’re ready to eat within a couple of hours. The only trouble with them is that I have to make them when (the egg-hogging) husband is out of the house so they remain hidden from him for as long as possible. It’s the only way they have a chance of lasting more than one day. My marriage will be turning nine years old in just twelve days. In those years it’s faced some challenges; the act of parenting brings with it very high highs and very low lows. 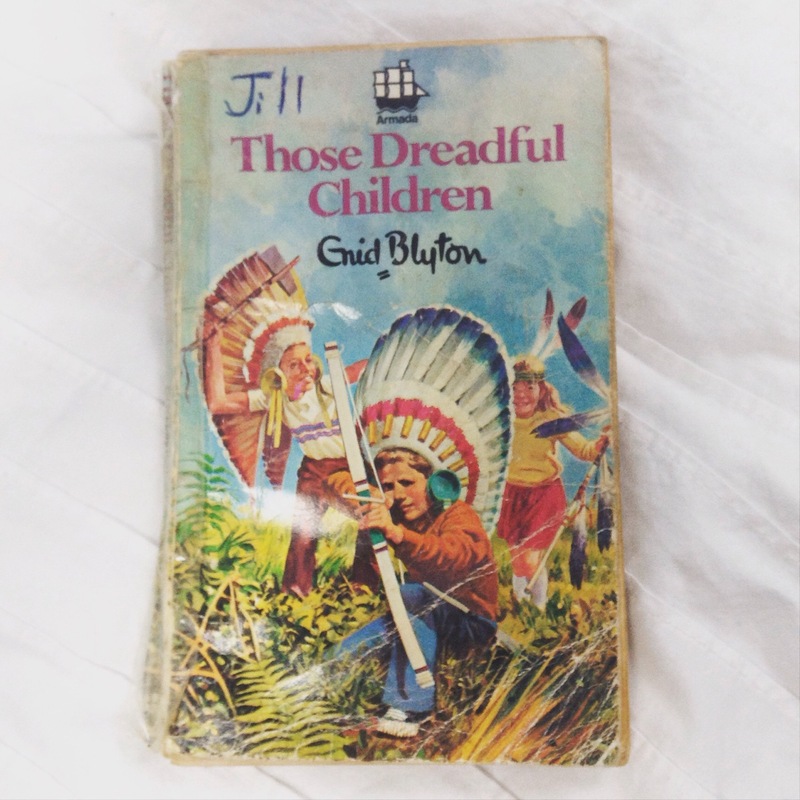 Sleepless nights, sick kids, childcare costs, differing methods of disciplining: they all contribute to frayed nerves for the adults of the house. Then there’s the other stuff; job loss, emergency car fixing, negative equity. There’s been arguments over breakfast, over dinner and late into the night. We’re not perfect. Our five year old has asked us to stop shouting. I don’t think they’re scarred though; they see plenty of love and cooperation from us too, and we all muddle along okay. Do you know what hasn’t affected our marriage though? Other people’s marriages. Other people’s divorces. Do you know who deserves the chance to have a messy marriage like ours? Since I was made redundant someone has to take up the slack round here. It’s looking like Ted really wants a desk job. “I wanna get some work! I think by “work” he means the Sesame Street YouTube channel.